As I write this, Nel­son Man­dela is in frail health but still with us. No, let me cor­rect that, Nel­son Man­dela will always be with us. Rather than try to sum­marise the achieve­ments of this stel­lar leader, here are some key links for you. I’ll then share how Pres­i­dent Man­dela affect­ed my own life and sense of lead­er­ship. Bio.com has an excel­lent short biog­ra­phy. 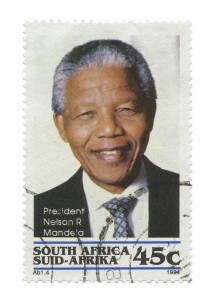 Nel­son Mandelas.com has many links, videos and obser­va­tions about his achieve­ments. The Nel­son Man­dela Cen­tre of Mem­o­ry has a time­line of his life. The Inde­pen­dent pub­lished the text of Nel­son Mandela’s speech when he was sworn in as pres­i­dent of South Africa in 1994. Mandela’s speech came late in the day — two hours behind sched­ule — after a long after­noon of speech­es and song. And while the ANC leader was mak­ing stops in Rox­bury and at the JFK Library, the crowd at the Esplanade’s Hatch Shell slow­ly grew [to 250,000], some­times impa­tient­ly but always expect­ing some­thing great. I can tell you that I recall that night and his speech vivid­ly today. It was that pow­er­ful. On that tour, I was able to expe­ri­ence the vibrant spir­it of the town­ship and learn more about its her­itage. One of the high­lights of this vis­it was strolling down one of South Africa’s most famous streets — the only one in the world to have housed two Nobel Prize win­ners, Pres­i­dent Man­dela and Desmond Tutu. One can­not help but be move by such great­ness, with the two homes with­in a few hun­dred metres of one anoth­er. Pres­i­dent Mandela’s house is open to the pub­lic and pro­vides you with a glimpse of his life at one par­tic­u­lar moment in time. Years lat­er, I saw the movie, Invic­tus. The moment when Man­dela, wear­ing the team colours of the Spring­bok (which were a pow­er­ful sym­bol of Apartheid ZA), pre­sent­ed the Rug­by World Cup tro­phy to the team’s cap­tain on the world stage still stands, to my mind, as one of the great­est lead­er­ship moments in my life­time giv­en its humil­i­ty, sym­bol­ism and its trans­for­ma­tion­al impact on South Africa and the rest of the world. The body of Nel­son Man­dela may have fall­en into irrepara­ble poor health. But the spir­it of the man will endure as long as peo­ple admire true lead­er­ship for its pow­er to both improve soci­ety and inspire peo­ple to make their own lives bet­ter.